Most people will have only one metal detector on the go at any one time and for quite a long time when you think how much they cost, but not Nick, you'd need two sets of hands to count the number of detectors he has owned. Currently Nick has gone against the grain and now only has one detector on the go, an XP GoldMaxx Power with WS wireless headphones, he reckons it's the dogs dangly bits. Rob has a C Scope 1220XDP and would'nt give it up for anything else not even if you were giving him an Explorer II. Pete has Minelab Soveriegn XS2A, Kev and I both have a Minelab Sovereign Elites, but I've got my nose hanging over an XP too. 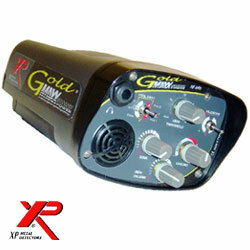 The Gold Maxx Power is an exceptional detector to find little targets in difficults type of soil (mineralized*). The Gold Maxx Power is also fitted with a new, powerful circuit board combining performance and choice � two aspects which are usually very difficult to bring together. The Gold Maxx Power is streets ahead of its competitors with a similar search coil diameter in terms of speed of analysis. The Gold Maxx Power is still a "multi-tone" detector, but user can now adjust the iron level setting by using the IRON THRESHOLD potentiometer. This potentiometer can be viewed as a detection setting with a range only covering iron. It has fine-tuning settings ranging from 0 to 20. At 0, all iron sounds at medium pitch. The higher the setting, the lower the pitch for detected iron. This, for example, enables small nails just to be picked up at a low pitch, whereas larger ones will be detected at medium pitch. As you will doubtless already know, too high a level of discrimination can hinder the performance of a detector. With the gold MAXX Power you will find more than gold ! This is Nick's new machine, he's still experimenting with the settings, but the number of hammered coins thats come up with this machine is unbelievable. This machine will weedle out those small coins right next to iron no bother. Nick reckons for inland detecting is the dogs dangly bits and nothing can touch it. The only thing that lets it down is no discrimination and notch for the pound coining season, but he can live with that and he'll buy another Sov to cover that problem. The Sovereign Elite discriminates between good targets and unwanted trash. It will perform in any soil conditions and will ignore salt and ground mineralization. The discrimination circuitry eliminates signals from unwanted trash while the Iron Mask feature enables you to identify valuable targets lying next to ferrous junk. Turn it on, set the controls and start searching, only Minelab technology makes it this easy. This is a solid detector, four of us have owned the Soveriegn, we've found lots of hammered coins from farthings to gold half nobles, lots of artefacts, this detector is an excellent all rounder, the only reason we can't give this detector top marks is weight, the Soveriegn could do with the control box being re-modelled with micro technology and having a light weight coil for inland use. The C scope 1220XD is a unique machine and was originally conceived by the C-Scope research and development team more than 20 years ago. The design has been refined and honed to perfection, the audio discrimination feature allocates a tone to every target object, which rapidly becomes a language which you can interpretted. This model has now been replaced by the 1220R. Rob loves this machine, hes had it for years now and its still going strong, it has its own language, everything has a sound, its well balanced, and as its a non-motion machine there's no need to keep sweeping the head and although its not a deep seeker, if it passes under the coil you better start digging. The Shadow X5 is a professional performance, full-featured, deep-seeking, true all-terrain metal detector. It features turn-on-and-go operation with a choice of on-the-fly user options, including fixed or manual ground balance, target check, all metal and discrimination modes, VCO pinpointing, beach and black sand modes, frequency shifter, and a 9" round concentric spider coil. Extremely lightweight, completely weatherproof, powered by a single 9 Volt battery, and covered by a limited lifetime warranty. Light weight, you can swing this one around all day, but Nick found this machine very difficult to setup and very chatty. Nick thinks he should have kept this detector a bit longer to see what it could do, but it did his head in and it had to go. versatility made possible by the most modern digital electronics. The reason why committed 1220 users would not swap for anything else lies in the way the machine operates as an extension of the senses. friendly way - and the CS1220R adds the totally new dimension of computer control. Rob has one of these but won't give up his 1220 XDP so we'll probably have to come back here, but Nick had one as well for a short while and could'nt get to grips with its sqeaking and squarking, its more difficult to setup than the 1220 XDP, hates mineralised ground and could do with having the 25cm polo coil as standard. Again its not a deep detector and it works on non motion, but if a good signal is heard better start digging. 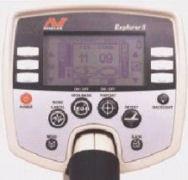 Explorer II is the latest top-of-the-line metal detector from Minelab. It replaces the world famous and hugely successful Explorer XS and is the most full-featured, informative, best performing metal detector available today, the NEW Explorer II raises the standard for metal detecting. This switch-on-and-go detector finds valuable coins, rings, jewellery and relic targets that others walk right over. Packed with exclusive features including SMARTFIND� 2 dimensional discrimination, 28 frequencies operating together in Minelab's exclusive Full Band Spectrum (1.5 to 100 kHz) technology and now with fast operating 2nd generation software. Explorer II is the world's best performing metal detector. Nothing even comes close! The Explorer II is an excellent detector whether your using in standard mode or advanced. Advanced is the best mode to work in after getting use to it, that took me a month, but after reading Des Dunnes "understanding the Minelab Explorer" document I soon got to grips with it and then started to tune it to my personal preferences. We have had loads of exceptional finds with it, Nick and me would probably still have too if it had not been too damn heavy, If your built like the Hulk you'll have no problems otherwise 3 or 4 hours of swinging this baby and you start to enter the pain barrier. The only other problem we could find was accurate pinpointing with the stock coil, other than that it was the bees knees.